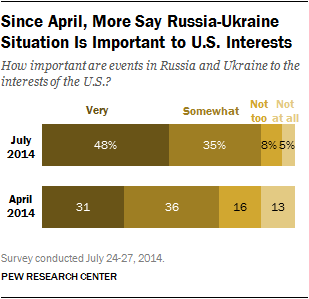 More See Events in Russia and Ukraine as ‘Very Important’ to U.S. Most Americans still are not inclined to view Russia as an adversary, though the share saying Russia represents a serious problem has continued to increase, according to a new survey from the Pew Research Center. Currently, 26% of the public says that Russia is an adversary, while 49% think it is a serious problem but not an adversary, and just 15% say it is not much of a problem. These opinions have changed only modestly since March, shortly after Russia’s annexation of Crimea. The share saying Russia is an adversary is unchanged since then, while the share saying Russia is a serious problem has increased six percentage points, from 43% to 49%. Since last November, however, there has been a substantial change in public views of Russia. 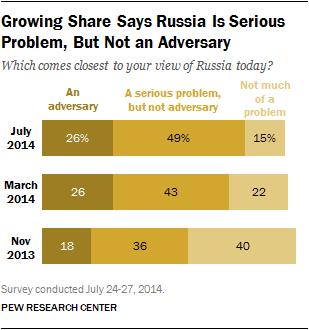 Currently, 75% view Russia either as an adversary or a serious problem, up from 54% in November. And the proportion viewing Russia as not much of a problem has fallen by more than half, from 40% then to just 15% today. A new national survey by the Pew Research Center, conducted July 24-27 among 1,005 adults, finds that compared with three months ago, the public is more likely to believe that the events in Russia and Ukraine are important to U.S. interests. 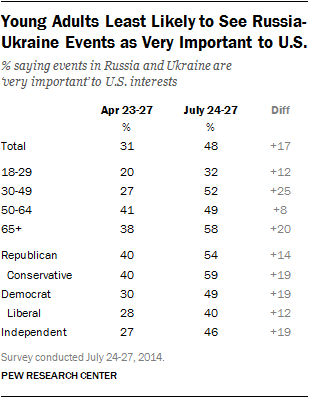 About a week after Malaysia Airlines Flight 17 was shot down over Ukraine, 48% say events in the region are very important to the United States, up 17 points from April (31%). 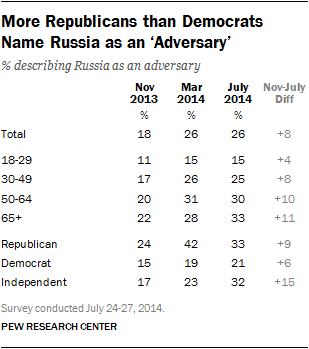 f Republicans who view Russia as an adversary is lower today than in March (42%), after Russia annexed Crimea. Independents are more likely to say Russia is an adversary now than in March (32% now, 23% then), while Democrats’ views are little changed. Still, more Republicans, Democrats and independents view Russia as an adversary today than did so last November. Younger adults remain the least likely to describe Russia as an adversary. Today, just 15% of those under 30 say this, compared with 25% of those ages 30-49 and about three-in-ten (31%) adults 50 and older. Still, about half of each age group labels Russia as a serious problem, but not an adversary. The belief that the situation is very important to the U.S. has ticked up across demographic groups. Adults 18-29 are still by far the least likely to say this — 32% say the situation is very important to the U.S., compared with about half or more of other age groups. Instead, young adults are the most likely to call the situation “somewhat important” to U.S. interests (52%). Democrats (49%) are roughly as likely as Republicans (54%) to say the events are very important to the U.S., up 19 points and 14 points from April, respectively. But conservative Republicans remain far more likely than liberal Democrats to believe what happens between Russia and Ukraine is very important to U.S. interests (59% vs. 40%).